In part 2 of our 2-part series on STEM, we follow up with My Stepping Stones, Leichhardt on their journey of implementing STEM and robotics in their centre. Here we learn more about how easy it has been to integrate robotics into the everyday framework and what resources are working well. Robotics has recently been introduced to your centre, how are you finding the experience? The introduction of robotics has been fantastic and very successful. The children are fascinated with the Bee-Bot and are eager to take turns coding it to make it move in different directions. We have been using the Bee-Bot in conjunction with the STREAM resources and the children have loved listening to the associated story, finding the landmark on the story mat and then coding the robot to move it on to the next part of the story. What have been the positive and negative elements of introducing robotics? The biggest positive element of introducing robotics has been seeing how engaged and enthusiastic the children are when working with the robots. They have demonstrated great attention span and focus, as well as thinking skills and turn-taking skills. The children have been able to learn about direction and order and the concepts of ‘left’ and ‘right’ through coding. There have been no negative elements to introducing robotics. What feedback would you give teachers who are just starting out with STREAM in the preschool environment? 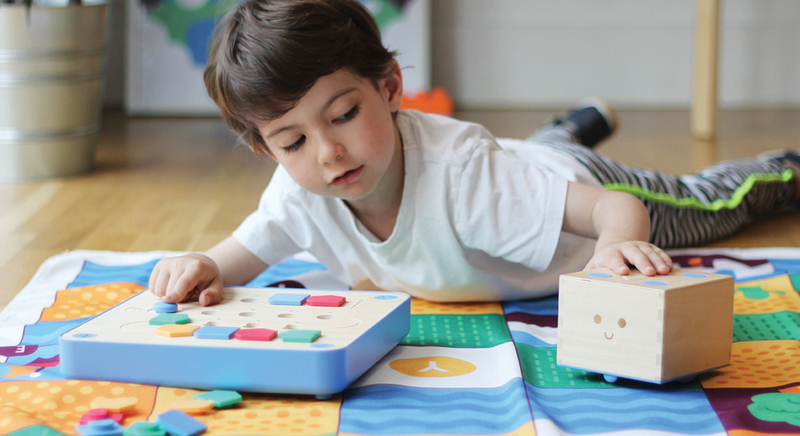 I would suggest starting off with the Bee-Bot or Cubetto and using them together with the story mats. This is a great, simple way to introduce robotics. The landmarks on the story mats are really useful visual aids to help the children understand the type of movement and direction the robot needs to take, and the books give handy cues on how to correctly code the robot on each page. Other robotics resources such as the ‘code and go robotic mouse activity set’ are great but were a little tricker for the children to code. 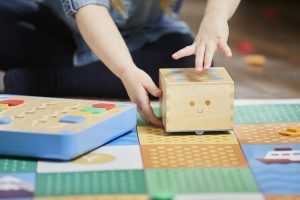 It would be a great follow-on activity once they are confident with the simple coding of the Bee-Bot. How have other staff members in your centre been trained to use robotics? I was fortunate enough to be offered training on how to use robotics by Donna Breen, a representative from MTA. It was a very interactive training session in which we were able to learn how to code the robots ourselves and really engage with the different resources. We also watched a short video on how the Makey Makey resource works and had the chance to ask lots of questions about each product. After the training session, I passed on what I had learnt to other educators in staff meetings and was able to give demonstrations once we received our resources. I also invited colleagues to watch some of the group sessions I had with the children so that they could observe how the children responded to the resources, which gave them a better understanding on how they could incorporate robotics into their classrooms. Like myself, they had a great time doing some hands-on experimenting with coding. Makerspace is hot at the moment, does your centre have a Makerspace area? If not, are there any plans to introduce one within your centre? We currently do not have a Makerspace area but are very interested in introducing one. We have explored similar concepts to those used in a Makerspace and the experiences have been very positive. We will look into how we can create such a space, a real hub of discovery and creativity that gives children the opportunity to explore engineering concepts by experimenting and creating with recycled materials and old electrical gadgets, using basic tools to ‘take apart’ technology and explore internal components. Do you use LEGO in your centre? If so, how do you use it? We do use LEGO in our centre. The children use the different sized bricks to build, create and problem solve. They are very creative in the structures that they build, and it is a great method for exploring mathematical concepts such as positioning in space and cause and effect, and for learning about structures and simple engineering. 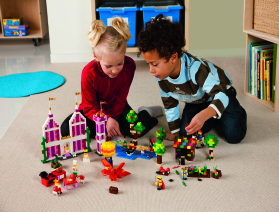 We also use LEGO to explore size, colour and shape, and for counting, hypothesising and lateral thinking. It’s a fantastic tool for increasing attention span and focus and supporting fine motor development in an engaging, creative way.